Built in 2011, White Manta is a modern steel hulled liveaboard custom built for divers. 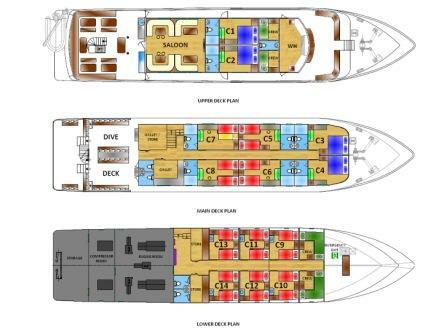 She is a very comfortable vessel with excellent cabins and heaps of space on board. She is IMO certified with all required safety features. 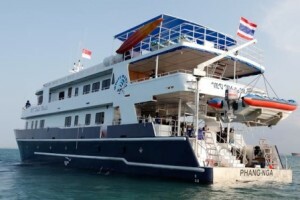 From November to April White Manta dives Thailand’s Andaman Sea. From May to October she runs weekend liveaboard diving trips from Singapore to Pulau Tioman, Pulau Aur and Jack Rock off Malaysia’s east coast, plus the Indonesia dive sites of Anambas Island, the Igara wreck and the 7 Skies Wreck. There are several cabin options with twin, triple and four share configurations. The spacious en-suite cabins on the main and upper decks have individually controlled AC and large windows that can be opened. 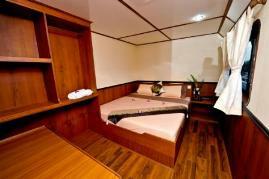 There are twin and double bed cabins available. 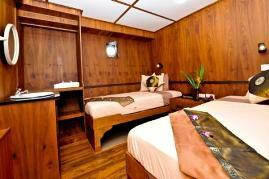 Standard cabins on the lower deck have shared bathroom but have their own wash basin. They have portholes. Prices exclude: Equipment rental,alcohol & soft drinks. National Park Fees/Entry Permits/Port Fees, Nitrox fills, 15 litre tanks, dive insurance. Friday: meet 5.30pm at Tanah Merah Ferry Terminal (just inside entrance on the left). Sail to Batam to clear immigration then sail overnight to the dive site. Dinner is served onboard. Saturday (4 dives): Check out dive at Pulau Damar, Katoaka Reef or Malangbiru, 2 dives at 7 Skies wreck and a night dive at Malangbiru. Sunday (2 dives): Morning dive at Igara wreck (depth 14-30m). Last dive finished by 12 noon. Summary: 6 dives, visibility 10-30m, water temp 28-30 degrees Celcius, diving for intermediate to advanced divers. Dive computer use is mandatory. Nitrox is recommended. The Seven Skies was a 261m long Swedish Super Tanker built in 1965. In 1969, she suffered an explosion and sank to the east of Tioman Island, not far from Anambas Islands. The wreck sits upright in 67m and is still intact. The top of the funnel is in approximately 25m, the bridge and the superstructure at 30m, then various decks and structures to explore down to the main deck level at 45m. Friday: meet 6.00pm at Tanah Merah Ferry Terminal (just inside entrance on the left), clear immigration then sail overnight to Tioman Island. Dinner is served on board. Sunday (1 dive): Morning dive at Bahara Rock or Pulau Jahat. Last dive finished by 8am. Return to TMFT Singapore, ETA 9pm. Summary: 6 dives, visibility 10-20m, water temp 28-30 degrees Celcius, diving for intermediate to advanced divers. Friday: meet 5.30pm at Tanah Merah Ferry Terminal (just inside entrance on the left), sail to Batam to clear immigration then sail overnight to the dive site. Dinner is served onboard. Saturday (4 dives): Check out dive at Katoaka Reef or Malangbiru and a night dive at Damar. Sunday (2 dives): Morning dive at Igara wreck (depth 14-30m) Sail to Batam to clear immigration. ETA 8pm to TMFT, Singapore.